This is my final comment on the subject of God and religion. Faith is just that, faith, it cannot be shown to be true or false, we believe what suits us, and there are a great many beliefs to choose from. We can even construct our own personal belief. I did not want to write this page as I felt it would upset a lot of people. It is written however, in response to all those who have sent me quotes from the bible to support their argument that the contents of the bible are true, that God does exist, and so on. Fair enough, it's up to them to believe in whatever they want and to worship whichever God they prefer, but I strongly defend my right to reject religion in its entirety. It is of course just as impossible for me to prove that all religions are false as it is for believers to prove that religions are true. However, the following are my reasons for why I do not believe in any religion. For the vast majority of people their religion is something that was forced upon them at birth and taught to them while at a very young and impressionable age. I do realise that some people find religion later in life as a mature adult, such as born again Christians for example, (note "again"), but they are very much in the minority in the overall world population. Some of us even reject religion as mature adults, even though we were raised in a religious belief. Religion is, to the majority, a belief system that they were indoctrinated into, not one they chose when they were of an age to make their own decisions, because by that time they were already conditioned into the 'faith'. Religion is therefore very much to do with a person's society, culture and history and says little about a person's faith. Faith of course is real, lots of people have faith in one religion or another, it's the truth of religion that I call to question. See the foot of this page for replies to my views from a Christian. This page is about religion, not just about God. I discussed that topic in What evidence is there for God? and Why does the universe exist? amongst others. The question raised here is much broader in the sense that I ask if any religion is true, or is the entire belief in religion and God (Gods), based on a falsehood or misconception, and that there is absolutely no basis in truth for any of it, other than as an entirely man made social construct. Let us look at one religion in particular and see what we can learn. I have chosen Mormonism, for no other reason than that it is a recent religion and therefore its beginnings are easier to research because they are well documented. I assure you that I have no particular grudge against this religion. Mormonism (The Church of Latter Day Saints) was founded by Joseph Smith, born 1805 in Sharon, Vermont. According to the official story of the LDS Church, in 1820 Smith was visited by God the Father and God the Son, after praying about which church he should join. He was told by Jesus, he should join none of them for they were "all wrong" and all the Christian church's doctrines "were an abomination" (Joseph Smith - History 19, Pearl of Great Price). This First Vision was followed by several visits from an angel named Moroni who, in 1827, directed Smith to retrieve a set of Golden Plates which had been buried in a hill near Smith's home in Palmyra, New York. Between 1827-1830, Smith, with the help of friends, translated the Golden Plates into the LDS scripture, the Book of Mormon. Published in 1830, this was to become the first of many scriptures for the Mormon Church. By this time, Smith had also officially organized the LDS Church and was gaining a following. Black people are black because of their misdeeds in the pre-existence (Three Degrees of Glory, LDS Apostle Melvin J. Ballard, p. 21). No need to comment on the unbelievable arrant nonsense of this point. The main point of interest here however, is how Joseph Smith started his new church. He claimed to have had a vision (he was the only one to have had this vision) that told him to start a new church with himself as the leader. (How fortunate for Smith). He was told where to find the 'golden plates' that contained 'the scriptures' (they just happened to be buried, by an ancient civilisation, conveniently near his home in New York). He set out alone and 'found' them alone. (No witnesses). Once found, only he could translate them with the aid of a mystical device that only he was in possession of. (Very fortunate). Smith allowed no one else to see the plates and 'translated' them in secret from behind a screen. (Okay, we've got the picture). Smith was a known trickster and fraudster and was charged by the police on a number of occasions for various offenses. Some may say that the whole thing was an obvious fraud devised by Smith to set himself up as the leader of a new church. Indeed, to believe otherwise would take a monumental leap of faith that would include leaving behind common sense and reason. BUT, Mormonism is a growing religion that has a massive following. Why? Because it was not 'Smith's ' idea, it was revealed to Smith in a vision, or so he claimed. This is crucial. If he had attempted to start this new church as his idea, without such a 'devine seal of approval' the entire concept would never have got off the ground. People wouldn't have believed tricky Smith, but the words of Jesus, that's a different matter entirely. It could be argued however, that it really doesn't matter how the Mormon Church was founded as many would say it does a lot of good anyway. As another example of religion we can look to Christianity and The Ten Commandments. Moses was leading the Israelites away from Egypt into the desert. After months of travel the masses were a little discontent, they were making golden idols and generally misbehaving, they needed strong leadership. They wouldn't listen to Moses, after all, what right did he have to tell them what to do? So Moses heads up (alone) into the high mountain and there, in complete secrecy, is given the ten commandments by God. He returns with the famous stone tablets and reads out the law, the word of God. The law must be obeyed without question because it comes from God, with Moses of course as His chosen spokesman on Earth. Sound familiar? This of course is pretty much the same method as adopted by Joseph Smith in modern times, and why not? it worked for Moses. The same theme, with variations, has been used time and time again in all religions since time immemorial. All religions have the same basic ingredients, with local variations. Laws are introduced in order to control the population. These laws come from a higher authority that can not be challenged because they come from a source beyond the reach, or question, of man. It keeps the population in check - follow the 'law' or be punished, obey and be rewarded, though not in this life of course which we admit is pretty horrible, but after you die and go to paradise. So go back to your grubby hovel, scratch a living from the dirt, bury your dead and don't bother us again with your stupid questions. It can be no coincidence that the countries that have the poorest populations also have strongest and harshest religions. Take for example how the terrorists that flew the planes into the World Trade Centre and the Pentagon willingly sacrificed their lives in the sure and certain knowledge that by doing so they would enter paradise. Without this belief I doubt if that many people could be persuaded to commit suicide for a political cause, but by making it a religious cause it completly changed everything, they believed they would not simply die, but instead enter paradise. Death is another reason for the strength in the beliefs of religion. The vast majority of people are naturally afraid of death, it is the normal fear of the unknown. By its very nature we can never gain knowledge of what may befall us after death, it is our worst nightmare come true. We all know for certain that we will die but do not know when, how or why. Religion is there to comfort us on our trip into the great unknown, all will be well, in fact it will be far better than anything you could possibly imagine. Now that's a really good sales pitch, work on people's fears then sell them the solution. Its like showing a potential customer some really dreadful photographs of fire damaged houses then selling them a dozen smoke alarms. My comments on religion however, are not to be confused with the way in which the church works within society. They do a huge amount of good work, some of them, and if that was all they did they would be a great organisation. As for the holy bible, its just a book like any other, it contains pages of printed text bound together. It does not possess any mystical power of course, any more than a daily newspaper. The content, however, is interesting in what it claims. It was once held as containing the absolute truth, but even this is being challenged.We no longer believe that the world was created in a few days. Modern church leaders are also saying that Mary, mother of Jesus, was not really a virgin, and so on. Back in the past people did genuinely believe the bible was 'gospel' and beyond question, but times, fortunately, have changed. The bible is being 'updated' so that it will again be acceptable to today's society. But is it really meaningful, can it be held up as 'proof' that God exists? No, of course not, we all know that, I may as well hold up a copy of 'UFO News" as 'proof' of the existence of flying saucers. In all discussions on Christianity, I know that at some point someone will start to quote at me from the bible to back-up their argument. I really wish they wouldn't bother, its meaningless to do so, because it requires that the bible be accepted as hard evidence, and as we have seen it quite simply isn't so. The bible can be interpreted any way you want, so why bother? And precisely how accurate are the stories in it anyway? So, to answer the question, are all religions false? that's for you to decide. But what do I believe? Read on if you like, as if you didn't already know. It is very difficult, if not impossible, to be completly objective about religion because we have all been raised to believe in one religion or another. How do you examine the subject without some of your own bias creeping in? I, for instance, was raised to believe in the Christian faith, simply because that happens to be the majority religion in the country, that by pure chance, I was born in. I didn't choose Christianity, I was less than a year old at the time I became a signed-up member of the church. I certainly do not believe in it now. I do not believe that God is a kindly looking, bearded, white gentleman sitting on his throne in heaven surrounded by angels, and yes, that is the picture we were taught to believe as young, impressionable children at Sunday school, along with a whole load of other stuff just as daft. As an adult, all this was revised and we were told it was just symbolic, but as an adult I was also told that only true Christians will enter the Kingdom of Heaven. So to all you believers of other religions, sorry, you won't be going to heaven, our local vicar told me. Clearly, Christianity is just as ridiculous as Mormonism. I saw a typical poster outside a church recently depicting an idyllic country scene, complete with pretty waterfall, a little mist, pretty flowers, lambs and song birds, bearing the slogan "God is love". Why is it that those who believe that God is responsible for the way the world is, only show the good things. 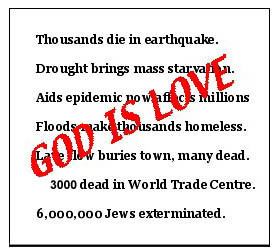 Would it not be just as correct to show say a picture of thousands of corpses as a result of a severe drought - and include the slogan 'God is love'? The church only promotes the one (good) side of God's supposed work. It is therefore, nothing more than a brainwashing propaganda exercise. The church must think us daft, and in order to believe their cozy, rosy picture of the world with good old father God taking care of things, we would have to be. If 'God' can be praised for any good event that happens in the world, then this is claiming that God is responsible for the way the world is. That being the case God must also be responsible for the bad things as well, so why not attribute them to Him? If the bad things are not due to God, who says so? God? To blame mankind for these 'bad' events can not be right. Is it our fault that we have droughts, storms, floods, volcanic eruptions, heat waves, ice ages, earthquakes, tsunamis, hurricanes, tornadoes, disease, etc.etc.? I find the way that the church "cherry pick" 'God's work ' to be extremely annoying. If its good, its the work of God, if its bad its just one of those things. Why not just accept the fact that events are the result of chance, cause and effect, and random factors? If you do believe God is responsible for the way the world is then as well as praising Him for the good things you would also have to blame Him for the headline events listed on the following poster. All religion is nothing more than an attempt to control a population by enforcing 'laws' that come from a higher authority that is beyond challenge, It is used as an extremely powerful tool to keep people 'in line'. It is particularly useful in circumstances where the population are under duress, be it poverty, starvation, tyranny. whatever, because then the powers that rule will assure you that you must accept your lot, lead a good life, don't rock the boat and cause any trouble, and you will be rewarded in the next life. Oh, good. The more you apply cold logic to it, the more senseless and totally meaningless the whole charade becomes, except as a means of control. If religion is nothing more than a man made device for controlling the people, why do people believe in it? Because they want to! Religion gives meaning to people's lives. See Is there a reason for our existence? It gives a sense of security and purpose. It helps people to accept the dreadful and terrible things that happen in this world, such as mass starvation, earthquakes, fire, flooding, illness, etc. because its 'all part of God's plan' and so on. It also helps them cope with the prospect of death and the loss of loved ones. This belief however, obviously does not prevent any of these events from happening, and believers and non-believers alike suffer the same deaths. Imagine for a minute that you are God with all his unlimited powers. (b) Appear before the masses and tell them direct, thereby proving your existence beyond doubt and at the same time ensuring that they get the right message. (b) Make regular appearances to reinforce belief. (b) Step in again with some timely advice. (b) Create a stable climate so that the population can grow their crops and feed themselves. For all questions answered (a), Really bad idea, award yourself nil points. For all answers (b), Well done! good choice, you get full marks. So why do we have all the above wrong answer situations in the world and none of the good answers? If you believe there is a God, how do you answer that? Why would He act in such an uncaring and nonsensical way? Please do not reply with that old standby phrase reserved for all tricky questions, 'God's work is beyond our understanding'. You can bet your life it is! Given unlimited powers any one of us could make a much better job of it. Take away this belief that there is a God, in whichever religious guise you happen to prefer Him, or a 'plan', and our existence seems rather nasty and pointless doesn't it. See Why does the universe exist? The universe is reduced to a cold unfeeling place that we just happen to have evolved in, that we struggle to survive in, and that has nobody out there looking after us because we are totally alone. When we die its all over for us, there's nothing more, and our descendants continue the eternal struggle for survival. We become nothing more than animals that happened to get smart and are here by pure chance alone, and by the same token at some point in the future may not be here at all. See Can we survive the next major impact? By removing God and religion we would merely throw away our security blanket, but nothing would really change, apart from society, and that must surely change for the better without religious divides. Life would continue as before and end as before. It would create a temporary problem for all those who's theories call upon God to have created the universe, but that would soon change. See Where did the universe come from? Our world is not perfect and never will be, so why not get used to it, because that's the way it is. Religion never has, nor ever will, solve anything. Only we can do that. As for religion, its just make-believe, a heart warming myth to pacify and control the masses who otherwise would not be quite so happy to accept their miserable lot, or their eventual demise. However, we would all be better off without it because no matter how unpalatable the truth may be, its better than living a lie. Please bear in mind that all of this is nothing more than my personal belief, the way I happen to prefer to view the world we live in. If you prefer to see it differently, that's fine, because as long as my beliefs do not interfere with your life, and yours mine, we do not have a problem over religion. Religion only becomes a problem when we fight over it, and countless millions of deaths can already be directly attributed to disputes over religion. It is not always possible to answer all emails, but all will be read and noted. Thank you. Book details page: "Science, the Universe and God"